"And ye have forgotten the exhortation which speaketh unto you as unto children, My son, despise not thou the chastening of the Lord, nor faint when thou art rebuked of him: For whom the Lord loveth he chasteneth, and scourgeth every son whom he receiveth. If ye endure chastening, God dealeth with you as with sons; for what son is he whom the father chasteneth not? But if ye be without chastisement, whereof all are partakers, then are ye bastards, and not sons. Furthermore we have had fathers of our flesh which corrected us, and we gave them reverence: shall we not much rather be in subjection unto the Father of spirits, and live? For they verily for a few days chastened us after their own pleasure; but he for our profit, that we might be partakers of his holiness. Now no chastening for the present seemeth to be joyous, but grievous: nevertheless afterward it yieldeth the peaceable fruit of righteousness unto them which are exercised thereby." In Christ's obedience to his Heavenly Father in all things commanded we see his Heavenly Father's love for us. Jesus came to establish His Father above all fathers, establishing His Kingdom as "not of this world." The Father sent His Son, with the Son humbled himself, becoming as a man, in the flesh, as a child, in obedience to His Father's every command, dying on the cross (doing His Father's will), shedding His blood, covering our sins, 'redeeming' us from His Father's wrath upon us for our disobedience (imputing His righteousness upon us according to our faith in Him, as a child has faith in his father), with the Father raising Him from the grave to 'reconcile' us to Himself (that we might take part in His Holiness throughout eternity), setting His Son on His right hand, giving Him the keys to the kingdom, the Father and the Son sending the Holy Spirit, the comforter to guide us in all truth—in obedience to the Father's and the Son's will (John 16:3), with the Son waiting for His Father to tell Him when to go and get His bride. From the Son's "I must be about my Father's business" (age 12), depending upon His Father's words, i.e., "It is written," in the temptations, praying with His Father in the garden (John 17:1-26), to his last words on the cross, "It is finished" it is all about the Son doing His Father's will, wanting us to do the same. It is the Son's desire that we come to know His Father, i.e., come to know His Father's love for us. "Upon this rock I will build my congregation" is the Lord Jesus Christ's response to Peter's "Thou art the Christ, the Son of the living God," the "rock" being "flesh and blood hath not revealed it unto thee, but my Father which is in heaven." (Matthew 16:17-18) Our fellowship with our Heavenly Father begins with "Our Father ...."
The message from the Apostles to us is based upon this foundation: the love of the Son for the Father and the love of the Father for us, both desiring our fellowshiping with them: "That which we have seen and heard declare we unto you, that ye also may have fellowship with us: and truly our fellowship is with the Father, and with his Son Jesus Christ." 1 John 1:3 The fellowshipping of believers together begins with their personal fellowshipping "with the Father, and with his Son Jesus Christ." Without that fellowshipping taking place first, all that is transpiring is hypocrisy and/or apostasy. All that the prince of the power of the air (the master facilitator of 'change') can do is come between us and the Father, 'redeeming' us from the Father, 'reconciling' us to the world, that we might die in our sins, spending eternity with him and his angels in the torments of eternal death. It is what dialectic 'reasoning' is all about (and those promoting it): establishing the child's "self," i.e., man's carnal nature over and therefore against doing our Heavenly Father's will, negating the father's/Father's authority system in the children's feelings, thoughts, and actions, and in their relationship with one another, making them children of the world only, i.e., "children of disobedience." Sigmund Freud wrote: "'It is not really a decisive matter whether one has killed one's father or abstained from the deed,' if the function of the conflict and its consequences are the same." (Sigmund Freud in Herbert Marcuse, Eros and Civilization) It is not a matter whether the father is present or not (alive or dead, present or absent). It is that he no longer insists upon his authority in the home. His (and his family's) rejection of his authority 'liberates' him and his family from having a "guilty conscience" for doing wrong, creating a society of unrighteousness and abomination, i.e., "of and for self" only. Once you realize that the earthly father's authority system over the home is the same authority system of God's over the creation, you realize that the only way to negate God's authority system in society is to negate the father's authority system in the home (in the individual). As long as the father's authority system remains in control in the home, social(ist) control, i.e., 'change' ('liberating' society from God's authority) will continue to be blocked or inhibited. This is due to the fact that when the child becomes a parent himself, he will initiate and sustain, by nature, the father's authority system in his home, sustaining the Father's authority system in society. Even Abraham Maslow came to understand this nature, yet he refused to acknowledge it publically (admitting that he was wrong) fearing the lose of respect with (approval by) his peers. After having children of his own, Maslow wrote: "Who should teach whom?" (children adults or adults children) "I've been in continuous conflict over this Esalen-type, orgiastic, Dionysian-type education." (Abraham Maslow, The Journals of Abraham Maslow) He admitted that taking their money (the children's allowance) away from them, i.e., removing their power of control over their lives, was the only solution to the problem. Thus the 'drive' and 'purpose' of dialectic 'reasoning' is to 'liberate' children from their father's authority system, negating the father's authority system in their feelings, thoughts, and actions, and in their relationship with one another, thus 'liberating' society from the Father's authority system, negating the Father's authority system in the citizens feelings, thoughts, and actions, and in their relationship with one another. Only by starting with the child's (or man's) "feelings" and "thoughts," i.e. the child's opinion (circumventing parental/Godly authority, i.e. parental/Godly restraint), can world unity be attained. Only by creating an environment (an "experiential chasm," Warren Bennis) where the child can feel, think, and act and relate with other's in the 'moment,' without awareness of or fear of the father's authority, can the child become himself again, as he was before the father's first command, rule, fact, or truth and threat of chastening for disobedience, i.e., carnal, i.e., "of and for self," i.e., of the world only. 'Liberating' the child's heart (his affective domain) from the father's authority, i.e. opening "Pandora's box"—a "box" full of evil, which, once opened, can not be closed—turns the child's heart against the father and his authority. Benjamin Bloom wrote: "What we call 'good teaching' is the teacher's ability to attain affective objectives through challenging the student's fixed beliefs and getting them to discuss issues." "The affective domain is, in retrospect, a virtual 'Pandora's Box.'" "There are many stories of the conflict and tension that these new practices [opening "Pandora's box" up, i.e., 'liberating' the child to share his opinion, i.e., his "feelings" about and his "thoughts" on authority, in the 'light' of his hearts desires) in the child's classroom experience] are producing between parents and children." (David Krathwohl, Benjamin S. Bloom, Taxonomy of Educational Objectives Book 2: Affective Domain) All teachers are "certified" and all schools (public and private) are "accredited" based upon their use of "Bloom's (Marzano's/Webb's) Taxonomies." entering into dialogue with the child, sharing his opinion, i.e., how he "feels" and what he "thinks,"
abdicating his authority—with the child and the father becoming "equal"—elevating the child's "feelings" over and therefore turning him against the father's authority system. then it is the father's right to bless, reward, chasten, and cast out that keeps the child subject to his authority, the "guilty conscience" (the father's voice in the child's brain, the fear of pain, including the pain of his rejection or disapproval, i.e. the desire for his approval being therefore evident) restraining the child when the father is not present. If you begin with the father's authority system, i.e. his commands, rules, facts, and truth and his right to bless, reward, chasten, and cast out then the child, out of fear of lose of pleasure (which includes the desire for approval) and fear of pain (which includes the fear of disapproval and lose of access to the father's money, i.e. blessings), the child remains subject to the father's way of thinking and acting. The dialectic formula (dialectic 'reasoning,' i.e., "self" 'justification,' i.e., the dialoguing of opinions to a consensus) is being used in education, in the workplace, in government, in the home, and even in the church, to make global dominance, , i.e., the "new" world order, i.e., Synthesis (S) a 'reality' (R). By making the child's "feelings" (CF)—pleasure-pain—and his "thoughts"—desires-dissatisfactions—the focus of attention, i.e., the thesis (T), the Father's authority (FA) and the "guilty conscience" for doing wrong is negated. The children, in consensus with their "feelings" and "thoughts" of the 'moment,' 'changes' the world. If FA = T then CF = A and S ≠ R.
But if CF = T then FA = A and S = R.
If we make the father's authority system (FA—"do right and do not do wrong, or else") the thesis (T), i.e., if we begin with the father's threat of chastening for doing wrong, then the child's feelings of the 'moment' (CF) becomes the antithesis (A), i.e., the source of conflict and tension and synthesis (S) i.e. the children uniting themselves as one upon their "feeling,' i.e., in consensus (with a "feeling" of "oneness"), i.e., socialism can not become a reality (R). But if we make the child's feelings (CF—his desire for pleasure and resentment toward restraint) the thesis (T), i.e., if we begin with the child's "feelings" (removing the threat of chastening for doing wrong, i.e., removing the father's/Father's authority) then the father's authority system (FA) becomes the antithesis (A), i.e., the source of conflict and tension, and synthesis (S), i.e. the children uniting themselves as one in consensus (with a "feeling" of "oneness"), i.e., socialism can become a reality (R), negating, i.e. "annihilated" (vernichtet) the father's/Father's authority system (FA) ("the earthly family" and "the holy family") in the child's feelings, thoughts, and actions, and in his relationship with other children participating in the process of 'change,' i.e., in the consensus process. Because since the earthly father desires pleasure, as the child desires pleaser, the element of pleasure makes the earthly father and the child one. Since God is Holy, desiring us to be holy, it is his chastening which makes it where we can participate in His Holiness. (Hebrews 12:5-11) Negating the earthly father's authority to chasten and cast out and both fathers, earthly and Heavenly, lose their importance in the thoughts and actions of the child, negating his having a guilty conscience for doing wrong, i.e., for sinning, i.e., negating Romans 7:14-25. The key to dialectic success is: if you can start with the child's nature, i.e. his natural inclination of approaching pleasure, i.e. to become at-one-with nature in the 'moment' (Genesis 3:1-6), and of avoiding pain, i.e. to negate whatever or whoever it is that prevents him from fulfilling his natural inclination to approach pleasure (with his desire for approval from "the group," which approves of his desires, becoming more important to him than the approval which comes from his father, who does not approve of his desires), then the father's authority system, i.e. his right to bless, reward, chasten, or cast out is negated. Dialectic 'reasoning' is given birth in the child's "Why?" voiced in response to the fathers demands (commands and rules) which inhibit or block the child's carnal desire of the 'moment.' The "Why?" not only contains the child's carnal desire, i.e. his "self interest" of the 'moment,' it also contains his hatred toward authority, which is restraining it. It is in the "Why?" that dialectic 'reasoning' becomes a reality in the child's life (with the child perceiving the father's commands and rules, which restrain his "self interest" of the 'moment,' as being 'irrational,' i.e. unreasonable in his eyes). Because the father refuses to participate in dialogue (compromising his position of authority), i.e. responding to the child's "Why?" with "Because I said so." the child's only recourse (other than attempting to physically overcome the father) is found within himself, i.e. talking to his "self," 'justifying' to his "self" that he is (his "feelings" or "self interest" of the 'moment' are) right and the father (the father's authority) is wrong. The American family has encountered this patterned of behavior (disrespect toward authority), especially from the 50's on, because of the teachers use of "Bloom's Taxonomies" within the classroom, introducing the students to dialectic process, i.e. 'liberating' their affective domain from parental authority, i.e. giving the child's "self interest," i.e. the child's "feelings" center stage (over and therefore against the father's authority), in the thoughts and actions of the children, now united as one upon "self interest," negating the father's authority in the home. While the earthly father is not perfect (he may be a down right tyrant), his office of authority is perfect—given to him by God that the child might come to recognize the Heavenly Father's authority, coming to accept Him as His Heavenly Father, through Jesus Christ, His obedient Son, Hebrews 12:5-11. Hegel, Marx, and Freud understood that by negating the earthly father's "top-down," "above-below," "right-wrong" authority system in the thoughts and actions of the child, the Heavenly Father's "top-down," "above-below," "right-wrong" authority system is negated in man's thoughts and actions, 'creating' a "new" world order which is based entirely upon the carnal nature of the child/man, i.e. 'creating' a world based upon the law of the flesh, i.e. "human nature" Only, negating the law of God, i.e. negating God's judgment upon sin (disobedience against the Father's authority) and the "guilty conscience" which ensues, thereby negating mans' need of a savior, Romans 7:14-25. The dialectic error is in the opinion that Jesus came to 'liberate' man from the law of God, i.e. from the Father's authority, when in truth Christ came to fulfill the law, 'redeeming' man from the Father's wrath, 'reconciling' him to the Father instead; the dialectic process, doing the opposite, i.e. 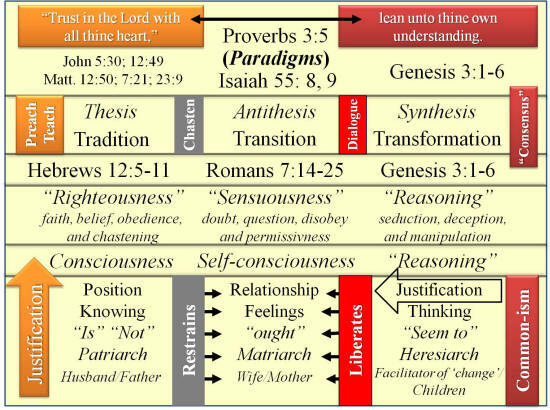 by 'reconciling' the child/man to the flesh it 'redeems' him from the father's/Father's authority instead. While the harlot draws the child away from the Father's authority, the beast is the children, emerging as one in their feelings, thoughts, and actions which are purged of the Father's authority, i.e. freed of Godly restraint, i.e. having no "guilty conscience" regarding their praxis of unrighteousness and abomination. Hegel, Marx, and Freud understood this. 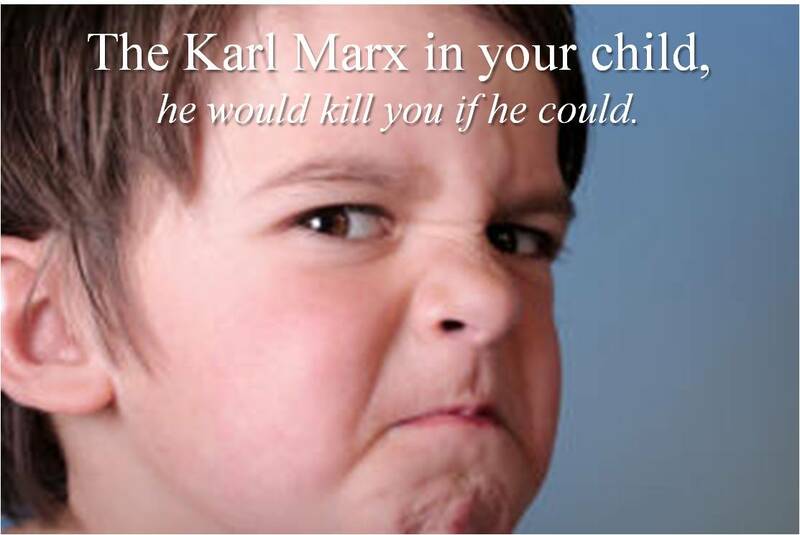 While Hegel identified the father's/Father's authority as being "the social problem," and Marx set out to purge society of the father's/Father's authority by force, Freud realized that the father's/Father's authority had to be removed from the child's feelings, thoughts, and actions as well if 'change,' i.e. the "new" world order (with man becoming only of and for himself, i.e. of "human nature" only, i.e. 'liberated' from the Father's authority) was to be initiated and sustained, i.e. initiating and sustaining the praxis of Genesis 3:1-6 as the means to creating "worldly peace and socialist harmony." Yet, while Hegel, Marx, and Freud, hating God, attempted to negate the Father's authority in the feelings, thoughts, and actions of men (by negating the father's authority in the feelings, thoughts, and actions of the child), they confirmed God's Word instead.